Readers Question: What is the cause of deflation? 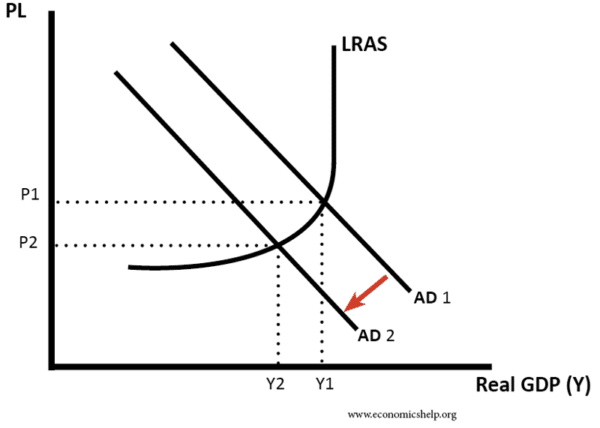 A shift to the right of aggregate supply (AS) – i.e. lower costs of production through improved technology. Deflation usually occurs during a deep recession, when there is a sustained fall in demand and output. This deflation may occur in the aftermath of credit boom and bust or severe tightening of monetary policy/fiscal policy. 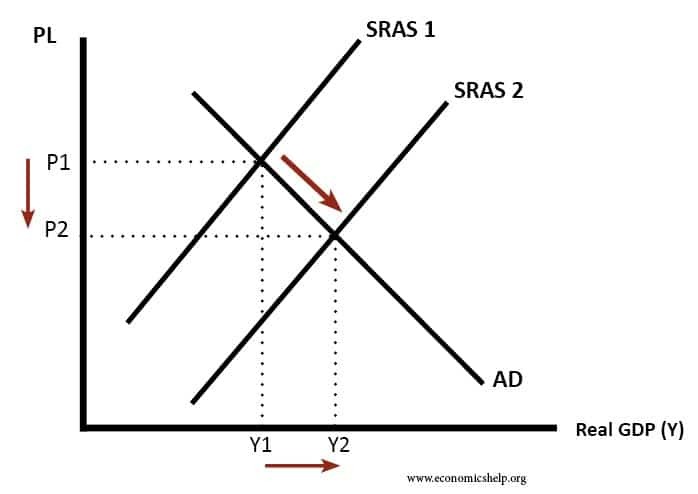 Monetarists emphasize the role of the money supply – falling money supply and/or falling velocity of circulation causing a fall in the price level. In rare circumstances, rapid growth in technology may enable lower prices, whilst at the same time increasing output. This could be termed ‘benign deflation’ as output increases. Also, a rapid drop in oil prices may cause a negative inflation rate. 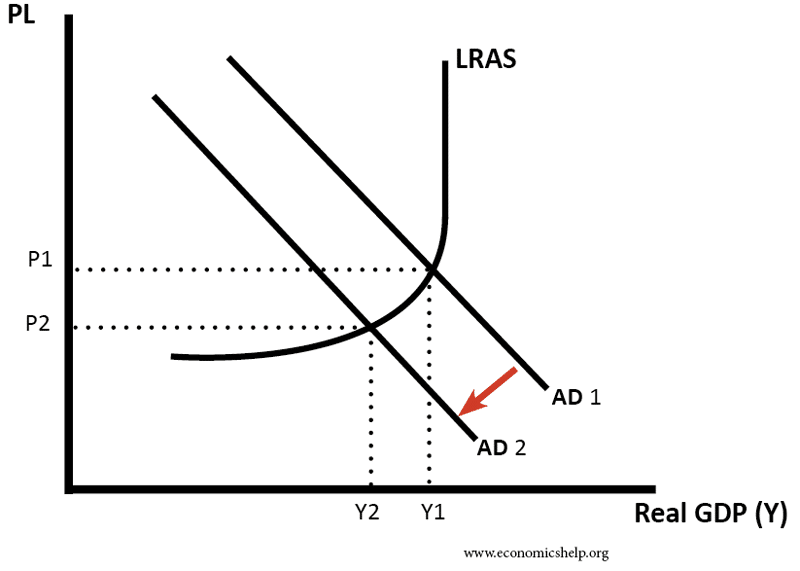 This simple AD/AS model shows that a fall in AD can cause a lower price level. Fiscal austerity. If the government cut spending and cut the wages of public sector workers – there will be a fall in spending and AD will fall. This occurred in southern Europe in the Eurozone crisis of 2012-16.
Credit crunch/stock market fall. In the aftermath of the Wall Street Crash 1929, many banks went bust. This caused a fall in the money supply and a fall in bank lending. With contraction in money supply and fall in spending, prices fell. Firms were trying to cut prices to attract customers to buy surplus stock. The paradox of thrift. In a serious recession, people become pessimistic about the future. Therefore, they are likely to increase their personal savings and cut back on spending. This causes lower demand and again firms may need to try and cut prices to encourage sales. In Japan in the 2000s, there were periods of deflation because customers were unwilling to spend. Debt deleveraging. After a credit bubble, people may be seeking to pay off debts and have to reduce their spending. Overvalued exchange rate and high interest rates to maintain the value of the currency. Tight monetary policy – higher interest rates. 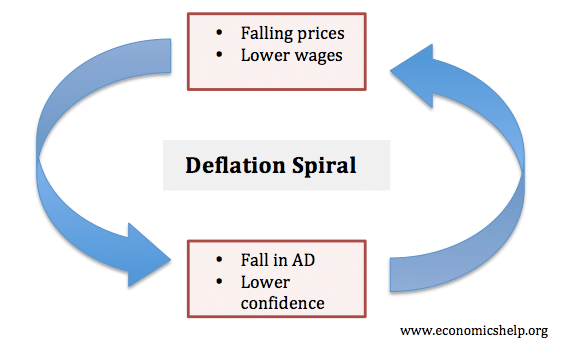 Deflation can become a self-reinforcing loop. Falling prices create circumstances for prices to continue falling. With falling prices – firms want to cut wages – lower wages lead to less spending (AD) and lower costs. Falling prices lead to a decline in confidence, and therefore lower spending and lower investment. Deflation leads to expectations of falling prices – people won’t spend unless prices fall and they can delay spending until they do. This is deflation caused by lower costs of production. This could be due to lower oil prices or improved technology, e.g. development of computer chips which enables price of manufactured goods to fall. This is considered a ‘benign period of deflation because we get lower prices – but output is also rising. We get the best of both worlds. 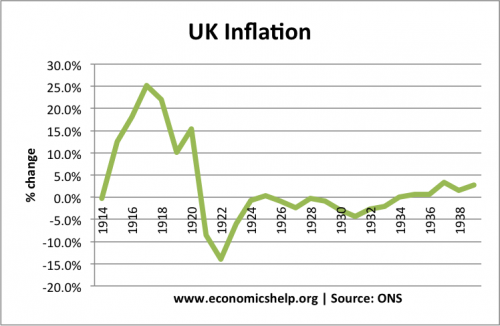 In the 1920s, the UK experienced several periods of deflation. This was due to several factors. One important factor was that the government tried to maintain the value of Pound Sterling against the dollar at close to $4.85 (this was the pre-war gold standard. The UK returned to this level in 1925). The high pound, made imports cheaper (helping keep prices low). But, the overvalued exchange rate also made UK exporters uncompetitive. Many firms were forced to try and cut costs to retain their export markets. This created a strong downward pressure on prices. Relatively tight fiscal policy (trying to reduce budget deficit through higher taxes, lower spending) After the end of the war, the government cut spending quickly. 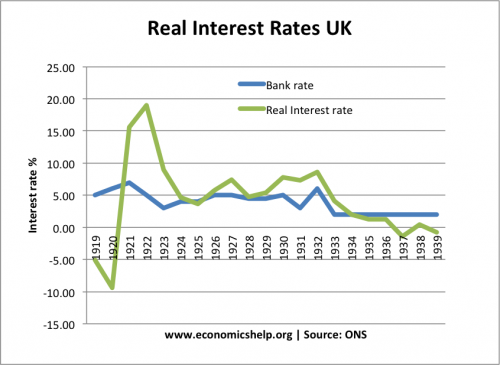 The UK experienced more deflation during the 1930s because of the extent of the recession/great depression. The US also experienced a period of deflation. One major cause of the US deflation was a fall in the money supply following the failure of many banks in the aftermath of the Wall St crash and the Great Depression. 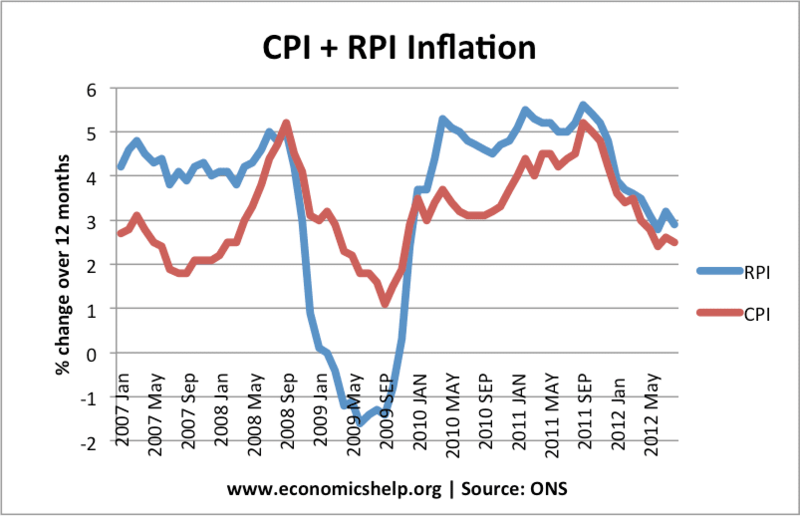 The UK experienced a period of temporary deflation during 2009 (if we use the RPI method, which includes interest payments). 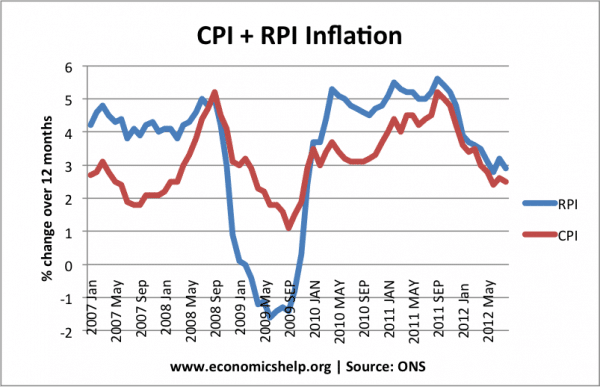 However, CPI inflation which excludes mortgage interest payments stayed positive. There was a sharp fall in output causing spare capacity and higher unemployment. But, there was significant wage and price rigidity. There was also substantial cost-push factors, such as rising oil prices. Monetary policy was very loose. Interest rates cut to 0.5% and from March 2009 a programme of Quantitative easing trying to increase the money supply. 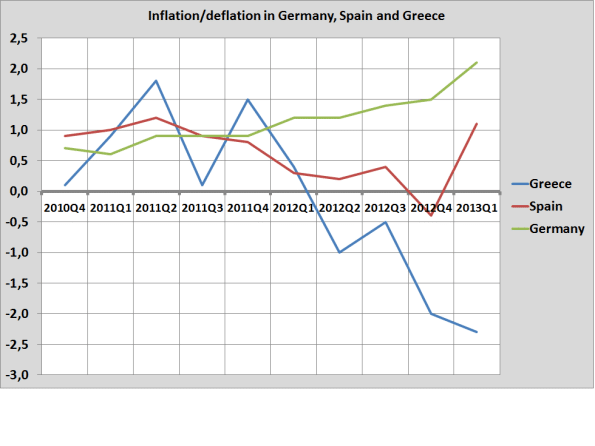 Therefore, overall the recession did not cause actual deflation. By contrast to the UK, countries in the periphery of the Eurozone, such as Greece and (to a lesser extent Spain) have experienced deflation. Due to the credit crunch, bank lending has fallen significantly; this contributed to a fall in the money supply. Deflation usually occurs during a prolonged and severe recession. It is a recession where demand falls significantly, and eventually, firms start to cut prices in a desperate attempt to boost spending. Also, if unemployment rises sufficiently, then we may start to see nominal wage cuts which feed through into lower prices. This entry was posted in inflation, Uncategorized and tagged deflation. Bookmark the permalink. At the beginning of your Explanation, you use the term “AS”, but do not say what words those letters refer to. Please tell me. Other than that, your Explanation is cogent. AS – stands for Aggregate supply. I will add to main text.